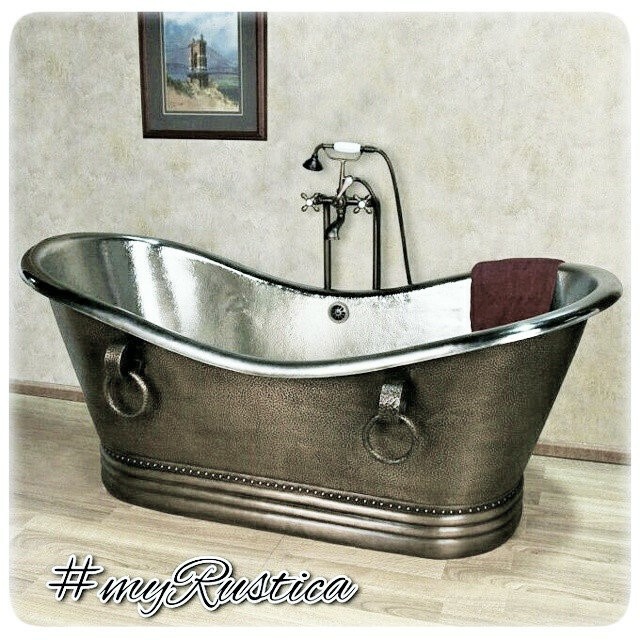 Click the button below to add the Copper Bathtub '9930' to your wish list. A dark color patina double wall copper bathtub is made of regular tub with an additional apron wall around it. It is a free standing bathtub meant for one or two occupants. Model #9930 height is about four inches greater than its depths. In other words, the bathtub copper bottom doesn't rest on the sub floor but it is suspended. It facilitates easy plumbing connection as well as installing an optional over-flow system. It will prevent bathroom disaster when water spills over the bathtub edge. This copper bathtub is handmade and available with various patina treatments. Beside the color shown on the product page image, it can be manufactured in honey, antique and natural which is the most rustic looking.